Hundreds of volunteers are needed for the multi-day Cornelius Book Brigade, scheduled to kick-off Presidents Day weekend, starting at 8:30 a.m. Saturday, February 16 through Wednesday, February 20, or until all the books are shelved in the new library. Volunteer sign-ups are available online (http://bit.ly/2W8rm9A).Don’t worry if you can’t make it, the Library Capital Campaign still has about $500,000 to raise, and both small and large donations are always welcome. In the plans for over ten years this community gathering place was spearheaded by a unique partnership between the City of Cornelius, BRIDGE and Bienestar Housing, the Library Friends and Foundation. Small communities know how to make the most of tight budgets and together these partners are nearing the completion of a grand vision. Cornelius Place is a $19.5 million project with a 14,000 square foot library on the ground floor, and 45 affordable senior apartments occupying the top two floors. The library portion of the project (representing $5.8 million) is funded without additional local taxes – funding comes from individual and business donations, Oregon Foundations, and county, state and federal grants. The housing portion (representing the remaining $13.7 million) is funded primarily through tax credits. 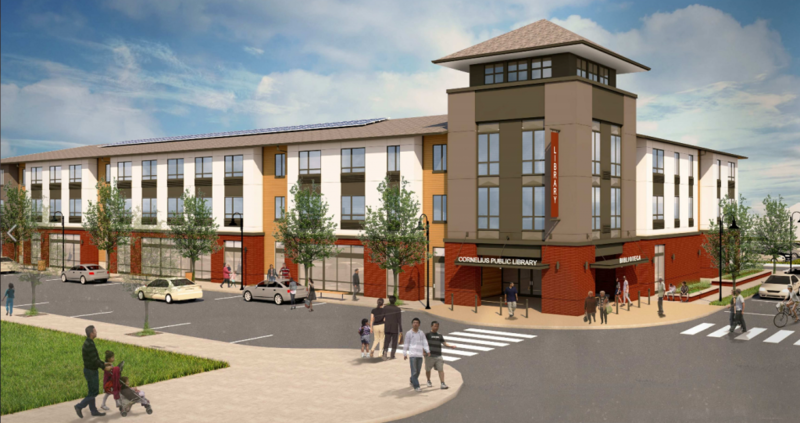 The small community of Cornelius currently lacks a senior or youth center and only has one public meeting room (at nearby Centro Cultural), so the new library facility will be a hub for community activities. It boasts many free resources including a 100-person meeting room, laptops to borrow, use of Internet computers and Wi-Fi, a teen room, a children’s literacy center, five study/conference rooms, a café and upwards of 30,000 books, magazines, videos on site. In addition, as a member of the Washington County Cooperative Library Services (WCCLS), the Cornelius Library offers local residents access to over 1.7 million items in the extensive countywide WCCLS collection. For more information about the new library expansion, visit the City of Cornelius webpage: www.ci.cornelius.or.us. The Cornelius Public Library is a member of the Washington County Cooperative Library Services (WCCLS), fellow members include the Aloha Community Library, Banks Public Library, Beaverton City Library Main, Beaverton City Library Murray Scholls, Bethany Library, Cedar Mill Library, Forest Grove City Library, Garden Home Community Library, Hillsboro Public Library Brookwood, Hillsboro Public Library Shute Park, North Plains Public Library, Sherwood Public Library, Tigard Public Library, Tualatin Public Library and West Slope Community Library.